Journey Latin America is recognised as the UK’s number one specialist provider of holidays to Central and South America and enjoys a strong customer presence in London, where they are based. However, with the capital being so saturated with travel ads, we saw an opportunity to make a bigger impact in other cities where we knew there were possibilities for expansion. After doing some research, we decided to focus on a city that has good access to the major London airports and which also offers fantastic opportunities to run a geographically tight, joined-up campaign. 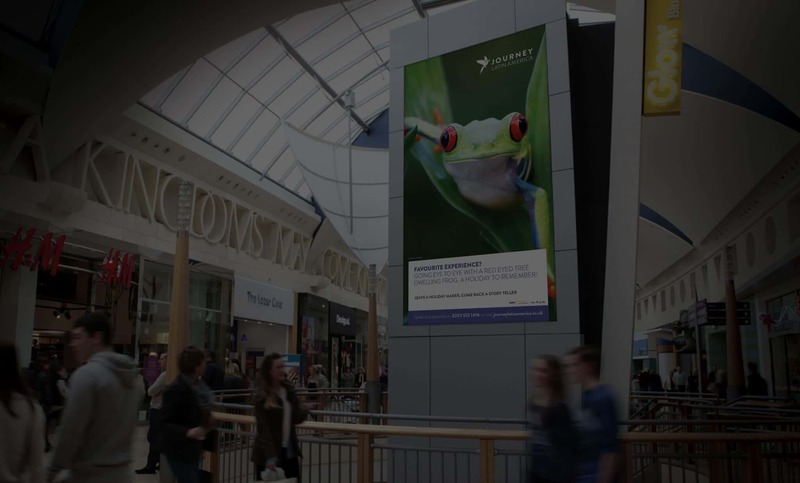 Our meticulously planned strategy was delivered in a way which made the campaign appear larger than it really was, with our multi-layered approach ensuring the city’s shoppers and commuters were surrounded by a range of striking and memorable ads. As well as making pragmatic use of traditional formats such as press and television, we also experimented with the likes of printed coffee cup sleeves and cinema commercials, helping to create a truly immersive and engaging audience experience. We were proud of our bold and exciting campaign, but even prouder of the results it produced. Overall, Journey Latin America saw a 23% uplift in activity from our target city whilst the campaign was live, massively expanding their reach in the area and leaving us with a very happy client!